1. Please place the stepper on smooth and stable ground. 2. Please check the stepper carefully before using. 3. Please wear suitable clothes and do warm-up exercise before exercising. 4. It is better to use the stepper with bare feet. 5. Please keep babies and pets away from the steeper for safety. 6. Please cool the stepper down when operating up to 20 minutes, and do not touch the hydraulic cylinder to avoid injury. Digital Monitoring: Owns an electronic meter, which can automatically track and record your exercise time, count and calories, and you will know your exercise progress at any time. 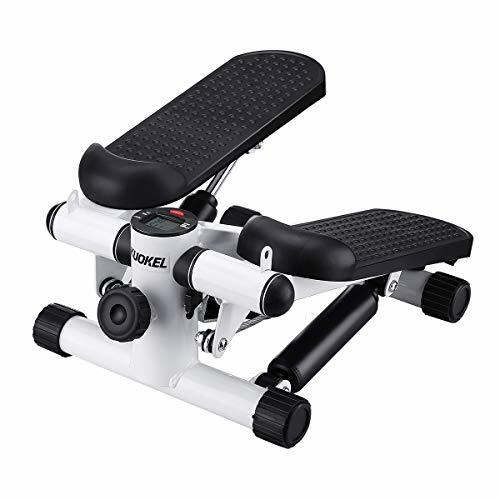 Comfortable Foot Pedals: The foot pedal is made of ABS material, with embossment on the surface, which is anti-slip and perfect to massage your feet when exercise with bare feet；Considerate Accessories: Equipped with an adjusting knob, and you can adjust the height of pedals according your need. Also includes two resistance bands, which can be used for stretching your arms. Stable & Anti-skid: The base frame is high quality and durable, which endows the stepper with stability and long service life. Rubber protective casing can reduce the damage to floor, and prevent the stepper from slipping when using. Perfect Performance: With hydraulic cylinder of high quality and spring with better cushioning effect, the stepper is more stable and safer in use, and provides you with better exercise experience. Compact & Convenient: It only takes up little space, you can put it any place in your house, and exercise at any time conveniently. The stepper is really a perfect fitness equipment to shape your arms, hip, waist, legs, and help to build a perfect figure. If you have any questions about this product by KUOKEL, contact us by completing and submitting the form below. If you are looking for a specif part number, please include it with your message.